At 3 am I woke up to loud banging in the rig. On the ocean, your boat rolls back and forth all the time. If there's no wind to fill your sails, your sail will flap back and forth creating hellishly loud noises in the rigging. Fortunately, I still had plenty wind. It had just changed dramatically on me during the night while I was sleeping. So, in the middle of the night, I got out on deck and took down my beloved pole and switched to a port tack. This was in my favor, and it was blowing 18-19 knots. For about an hour, I was heading straight for Hawaii with an extra knot of speed, but of course that didn't last. The rest of the night had lighter winds, but it is was good for catching up in that lost sleep. This morning was again overcast, but just like yesterday turned into a nice sunny day. I got to read a book, listen to some music and generally relax. I even did a little hand steering, just to enjoy a little actual sailing. My current course is taking me to the south tip of the islands. According to the weather download, the winds will get lighter in the NW, so I'm staying SE of my layline seeking out the stronger winds. At some point I'll have to gybe and head straight down wind to make it to Honolulu. I'm sure I'll need the pole again. Tomorrow, I should be crossing my 500 nm mark. I've saved coconut cookies to celebrate. 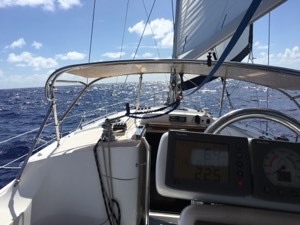 In the first 1000 nautical miles, I didn't pay too much attention to how far I was. Every so often I'd look back to see how far back the Golden Gate was, but I was mostly focused on keeping the boat afloat and staying out of harms way. Now, I'm constantly checking my distance left, my bearing to my mark, sail angle and trim. Not sure it helps, I think it might just be an indication that I'm a little restless and eager to arrive in port. Only 5 more days.